O.A.R. brought a Jamaican vibe to a sunny Midwestern Sunday night, June 30, at the Meadow Brook Music Festival with a nearly two-and-a-half-hour set of ska and energetic rock. O.A.R. was at Meadow Brook Music Festival on Sunday, June 30. In casual dress, O.A.R. opened the show with “Lay Down,” spending the rest of the 25-song set dancing on the lantern-lit stage. A horn section featuring two musicians added to the usual meshed with the guitar and vocals to create a reggae-style sound. 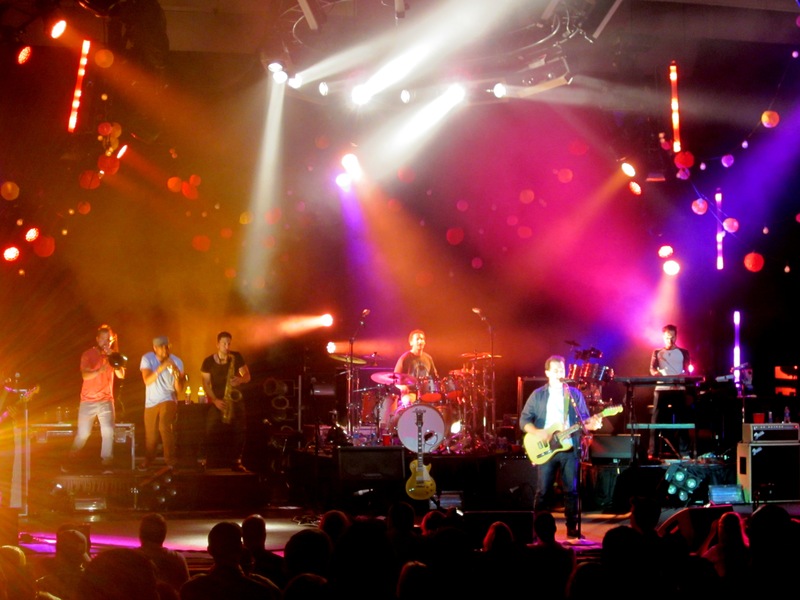 The radio singles “This Town” and “Shattered” showcased O.A.R.’s alternative rock side, though a majority of the songs, including “The Wanderer” and “Ladanday” brought back their early ska-leaning jam band sound. O.A.R. seldom spoke to or interacted with the audience, which long-time fans noticed over the course of the evening. Lead vocalist Marc Roberge did provide background on a couple of songs, however, including the single “Black Rock” which he said was about the group’s home state of Maryland. At one point, Roberge thanked an audience member for a homemade sign, and he took photos of the audience with his phone. There were many instrumental breaks throughout the show, spotlighting each of the band members. During “On the Radio” saxophonist Jerry DePizzo ran through the audience while performing his solo. After the keyboard solo in “Hey Girl,” the song faded out with a fast strobe light. The group also got a crowd response with “That was a Crazy Game of Poker” as fans cheered and threw playing cards into the air, an O.A.R. concert tradition. O.A.R. slowed it down with their first encore song “Peace,” an acoustic track, contrasting the rest of their set. For its final encore song, O.A.R. returned to stage with opening acts Allen Stone and Andrew McMahon for a lively performance of “Live and Let Die,” an interesting conclusion to the show because it brought another music style to the stage yet again.